In many ways, the photo of this little gem speaks for itself. Everyone loves a shaped picture disc, but throwing it in a printed PVC sleeve really takes it over the top. Truly fitting for this fine tune, by one of Europes most popular Oi! outfits. This Dutch powerhouse first formed in the 80s, but really exploded out of the gate with their album debuts starting in the early 2000s. 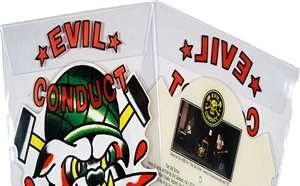 Gaining momentum ever since, EVIL CONDUCT is now a staple in the punk world, and "That Old Tattoo", which was released in the summer of 2014 on a split with GIMP FIST (Randale Records), has become an instant classic. Tattoos are central to this band, as Han, the singer/guitarist, is himself a tattooer; something brought to life in the fantastic video for this song. (www.piratespressrecords.com/TOT) Its hard to believe that this track was only released in 2014, as its quickly become a fan favorite, and very much a crowd favorite at gigs all across Europe. On that note, the B-side is a raucous rendition of their 1986 demo "Ultra-Violence," recorded live in 2014, at Wild at Heart in Berlin. With as cool of a record as this is, and being that they are limited to 1000 pieces, youre gonna want to jump on these quickly!